As president of The Rockefeller Foundation, West Bloomfield Township native Dr. Rajiv J. Shah is on a quest to make the world a better place. 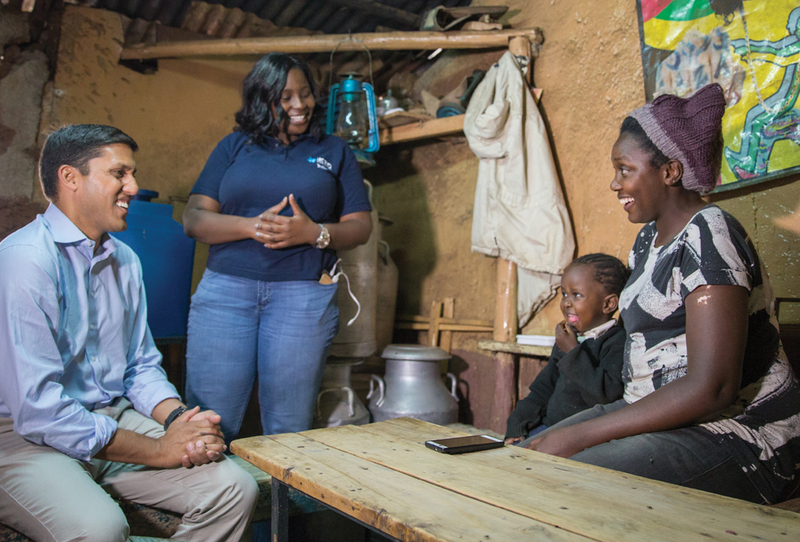 Long before Dr. Rajiv J. Shah became president of The Rockefeller Foundation in New York City in 2017, he earned a reputation for his dedication and passion for finding solutions to an array of humanitarian crises around the globe. He readily attributes the genesis of that commitment to a trip he made with his family to India when he was a young boy. “One of my uncles took me into a slum outside of Mumbai,” Shah recalls. “Even today I can close my eyes and (remember) the sights and smells, and the kids that were smiling and playing happily with a ball in raw sewage — the kinds of impoverished conditions and poverty that I’d never, ever before seen or understood existed in that visceral way. What Shah witnessed on that trip was a stark contrast to the life he lived growing up in West Bloomfield Township. Shah’s father worked at Ford Motor Co. and the journey he took — literally — to secure that job left an indelible impression on his son. “(My grandfather) cashed out his entire retirement savings account to buy my dad a one-way plane ticket to come to the U.S. from India in the late 1960s, knowing that if he succeeded, he would be able to take care of so many people in his life, including his own children,” Shah says. For a time it seemed Shah might follow the path his father had forged, and pursue a career in the auto industry. Then Nelson Mandela visited Detroit in 1990, three months after his release from a 27-year prison sentence as a political prisoner in South Africa. Shah, just 17 years old and finishing his junior year at Groves, was mesmerized. And Shah did, indeed, pursue medicine — “out of a desire to help kids,” he says — but he also studied at the London School of Economics during his junior year. He ultimately graduated from Michigan with Phi Beta Kappa honors and an undergraduate degree in economics. From there, he made another memorable visit to his family’s native country. Shah went on to earn a medical degree at the University of Pennsylvania School of Medicine, followed by a year at the Wharton School of Business, where he added a business degree to his resume. “Outside of my training as a doctor, I didn’t practice medicine,” Shah says. “When I completed my degree at Wharton, it was with an eye toward being involved in health policy. After my last set of board exams, my girlfriend and I — she’s now my wife — got in our car and drove 14 hours to Nashville, and I started as a volunteer on Al Gore’s presidential campaign. The most immediate opportunity came in 2001 with the Seattle-based Bill and Melinda Gates Foundation, where Shah filled a range of leadership roles over the ensuing eight years. “They were just at the point of setting up their foundation, and spending billions of dollars and (putting) a tremendous amount of time and effort and intellectual energy into seeing if we could, quite literally, save millions of children’s lives around the world,” Shah says. To that end, he helped launch the Alliance for a Green Revolution in Africa, a promising agricultural-development program, as well as the International Financing Facility for Immunization, which raised more than $5 billion for childhood immunizations worldwide. Shah left the Gates Foundation in 2009 to serve in the administration of incoming president Barack Obama. His first stop was in the Department of Agriculture, followed by nearly six years at the helm of the U.S. Agency for International Development, where he managed a $20-billion budget and led a team at the forefront of responding to major disasters and crises worldwide. In 2015, Shah left the federal government and founded and served as managing director at Latitude Capital Group, a private equity firm in Washington, D.C., that specializes in investments in power and energy projects in emerging markets, particularly in Africa and India. After two years, he couldn’t tame his desire to make an even greater impact on global prosperity. Following the departure of Dr. Judith Rodin in March 2017, Shah, at the time a trustee of The Rockefeller Foundation, became the organization’s 13th president. With an endowment of $4.5 billion, The Rockefeller Foundation has given away more than $18 billion in its 105-year history, and Shah believes today’s challenging times create a unique opportunity for philanthropy to play a more significant role than ever. To that end, he’s using his experience in the capital markets to forge more durable private-public partnerships. “We live in a moment in time when our politics and governance are deeply fractured,” he says. “Most Americans have lost trust in Congress, the executive branch, big companies and institutions, and even the courts to address and solve the problems we face. Under the leadership of the 45-year-old Shah, the foundation developed the U.S. Jobs and Economic Opportunity Initiative, which includes programs to support wage growth, benefits, economic development, and programs related to taxation. The program was inspired, in large part, by his father’s successful career. After joining The Rockefeller Foundation, one of the first trips Shah made was to Dearborn, home of the historic Ford Rouge Assembly Plant, where today the F-150 is produced. His dad tagged along for the visit. Shah’s parents still live in the same house where he grew up. His mother, a retired Montessori teacher, is a volunteer who teaches reading skills to second- and third-graders. “We love Detroit,” says Shah, who returns to his hometown whenever his schedule allows. “I had the opportunity to grow up and learn a set of values that are really grounded, and I feel I have a unique responsibility to give back to the city and be part of all that’s going on there. “It’s really fantastic. The last time I was there I visited with all sorts of community groups, and I was surprised to find some of my former colleagues had moved to Detroit and were part of rebuilding the city — starting small businesses, investing in housing, and thriving there.